Mark your calendars on June 25 and head-off to either Astroplus The Block or Odyssey Megamall as early as 11:00am for this fun-filled festivity! Loads of your most-wanted exclusive and limited edition freebies will be given-away such as original version of GG photo card sets, posters, folders, stickers, plus the chance for all the early-birds to get limited edition glow-in-the-dark GG ballers for free when they purchase both albums! And to further heat things up, MCA Music will also be throwing the first-ever Girls Generation cover group dance contest which will showcase various contenders who will be showing-off their ultimate GG-signature dance moves as they vie for fame and wonderful prizes! Let’s paint the town “yellow and black” for this ultimate K-Pop event on June 25, brought to you by MCA Music! 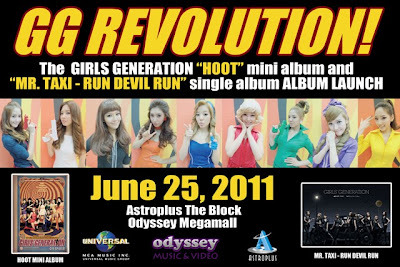 ‘Hoot’ is Girls Generation’s third mini-album which garnered instant success, reigning music charts with its first hit single, “Hoot.” On the other hand, ‘Mr. 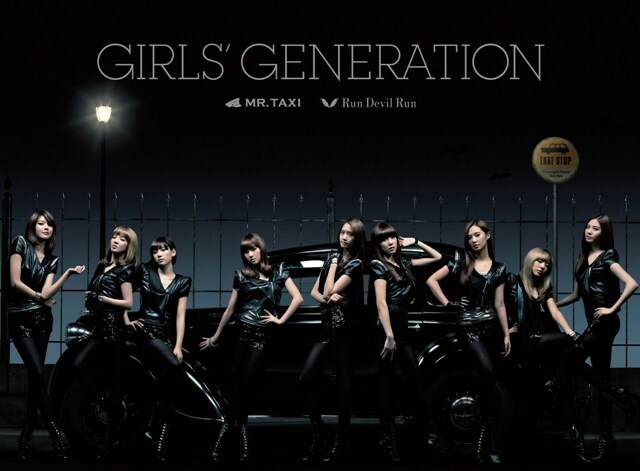 Taxi/Run Devil Run’ is their third Japanese-language single release which features an exclusive Deluxe Edition photobook plus it also comes with a DVD with the two versions of the “Run Devil Run” music video and a trading card. Get Girls’ Generation’s hottest hits on your cellphones and more!